Forget The Ashes – last weekend I ticked off an even more thrilling Bucket List ambition: a visit to the egg vending machine! 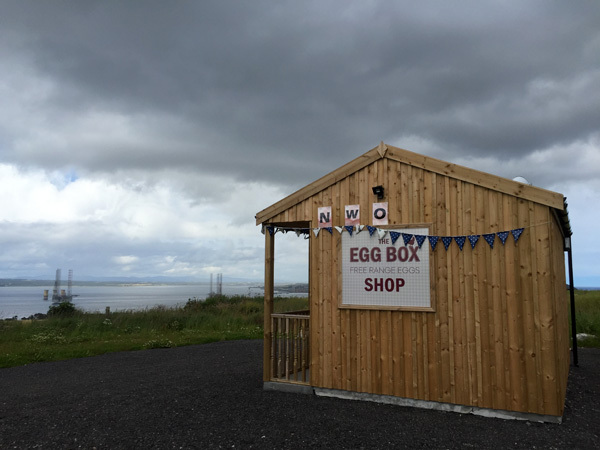 I think I first heard about The Egg Box Shop on Susan’s blog, when she spotted it on a day out in Cromarty. It’s located on a farm where the chooks roam free and produce award-winning eggs for the local community. The farm owners came up with the idea of having a vending machine so they could sell direct to the public, 24/7. I love a good vending machine. You can’t beat the gadgety joy of pressing a button… bleep! You win a prize! Even though you paid for it. So yes, totally worth a 40 mile round trip for the novelty of vending machine eggs. Behold, the WALL OF EGGS. There were small, medium, large and even double yolkers! I filmed Gareth making our purchase. I was so eggcited that I forgot to turn my phone into the horizontal position, hence the really annoying crop. Note the slow and methodical way he puts the coins into the machine. He chops onions in this same manner and every time I have to bite my tongue from saying, “Shove over and let me chop before we starve to death!”. This vending machine is particularly awesome as the little doors gives one a small insight into how it must feel to have a safe deposit box at a bank. But instead of bars of gold and top secret documents you get eggs! Delicious, tasty eggs. 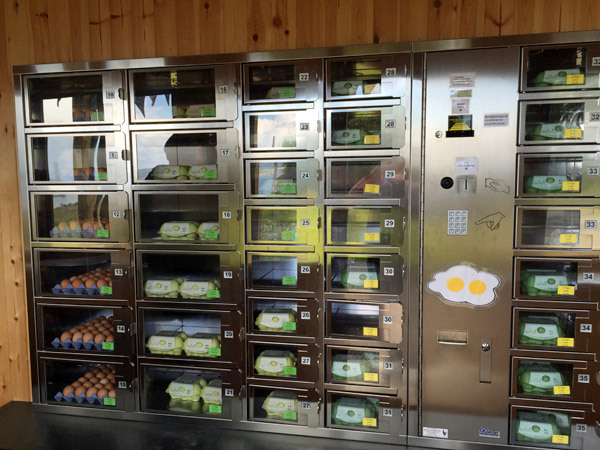 1 – An egg vending machine! Omelette smarter than this comment makes me look! Ahhhhhhhh…. egg humor. It never gets old! Oh, you do write so beautifully! – making a funny post about eggs. That buzzing sound when you “win” would scare the shot out of me and cause me to lay an egg of my own. Mmmmm croquette *drool* I’ll have to come over for a visit! We have v. machines for hot food but eggs on a farm in the middle of nowhere was a new one for me! 🙂 Apparently they do potatoes, too! Thank you Patricia! And yes that cracked me up too… concentrate, Gareth! Behold the wall of eggs! That is a pretty impressive operation they have going there. I was intrigued, I’ve been contemplating buying farm fresh eggs at our local stand on the weekends. But, since they are about 3x the cost of the ones at the supermarket – I haven’t given them a shot yet. The vending wall would be a clincher! (Cackle…cackle…cackle) Congrats to the enterprising farmer who has managed to beat the ‘Honesty Box’ system. No need for the Egg Wall here, nor the coins either. Our girls are generous (providing we feed them to supplement their free-ranging). A VENDING MACHINE OF EGGS?? Not just me who’s loving this. My entire family. Heidi cracked a double yolker today, and I was reminded to show them. This is now added to our list of ‘must visit’. Thanks Shauna. That is the best thing ever!! Definitely worth the 40 mile round trip. Thanks for sharing this utter delight.